I’m not much of one to hop on board the reality TV bandwagon. While I know about most of the shows (People magazine at the dentist’s office will fill you in, oh, so quickly! ), much of it just doesn’t hold my attention. I do enjoy The Amazing Race, primarily because I would love nothing better than traveling the world, partaking in all sorts of varied cultural experiences and foods. And on occasion, I’ve watched some other reality series here and there. For instance, while one of my sons was in Boy Scouts, we spent a lot of time watching Bear Grylls shows because the survival skills he showcased were valuable, not to mention pretty cool. If you’ve read other posts, you’ll know that I continued daily read-alouds to my high school homeschoolers, often consisting of biographies and such. Because my son was all gung-ho Bear Grylls, we read his autobiography. I enjoyed it more than I thought I would, because even though he’s very much a person of faith, he wasn’t shy about writing how he floundered a bit in his younger days. I think we all sort of lose our way at some point when independence is on the table. The safety net of the home we were raised in isn’t there, and we’re forced to stand up – or not – for our core beliefs. Usually, most find the way back to the same kind of values with which we were raised, but not until after we’ve gone a bit wobbly in the knees for a time. Anyway, Bear is pretty forthcoming about that time, and I appreciated my kids hearing and realizing one of their role models purposefully got his life back on track. Bear Grylls latest show is Running Wild. This particular show has him taking celebrities out into the wild areas of the states, and helping them survive, while also learning a little bit about the life of that celebrity. Apparently, being waaaaaaaaaaay out of your comfort zone, relying on basic and primal skills for survival causes famous people to open up and share more than what you’d read in an average US Weekly magazine interview. The other evening the show was on, and the celebrity guest was Deion Sanders, whose career I’ve followed since he played football at my alma mater. First, Deion is deathly afraid of snakes! He wouldn’t even eat the snake Bear caught, even though he’d probably burned a thousand calories and no other food was an option. But there were a couple takeaways from the show that really stayed with me…. How often in life are we not doing something because we carry so much fear into it? Usually, the fear prevents us from taking that first step, but if we do manage to take that step, once we start moving, the fear gradually ebbs, and courage and confidence prevail. Sometimes, I think we don’t want to take that step because we think we won’t look good enough doing it. In our little patch of rural-ness, there’s a nearby river, and on that river, there used to be a rope swing. When my kids were little, I wanted to jump off that rope to show them how not to be afraid. But I was secretly anxious about it. Not so much because I was afraid of heights, or because the water was too shallow or too cold (it was cold!!! ), but more or less because I didn’t want to look uncoordinated doing it. I wanted to look graceful and athletic, in command of my body. When I finally jumped, I was under no circumstances graceful or Greg Louganis-like. But my kids didn’t remember me looking like one of those convulsive balloon “people” in front of car dealerships. They only remembered that I let go. I was the one all hung up on making it look nice, but no one cared. Except me. It wasn’t pretty, I was just doing it. That’s all I needed to do to give my kids courage to literally take the plunge themselves. And who doesn’t want courage? You have to move laterally sometimes to move forward. Deion was coached by former FSU coach, Bobby Bowden, who was famous for his trick plays, including lateral passes. Often Coach Bowden’s (or Bobby, as we called him) offense threw a series of lateral passes to confuse the opposing team, enabling if not a touchdown, then at least a first down. Still, moving forward nonetheless. We’re trying to sell our house, and thought we’d be moving to Atlanta, but now we might not be. We’ve been at this house selling thing for much much longer than we’d like, and since we first listed it, we’ve had to adjust to where we’d move after it sells oh, about 4 times now. Seattle, Atlanta, stay where we are, Atlanta, Denver, stay where we are; it’s highly frustrating. Not just the not-selling part, but what happens after it eventually does. I’ve often felt like we just keep moving sideways, and never moving forward. It makes sense, moving laterally to move forward. The steps may not always be going the direction we want them to, but they are steps with the goal in sight. As if these two things weren’t enough (who knew how much a reality show on survival could show me!?! 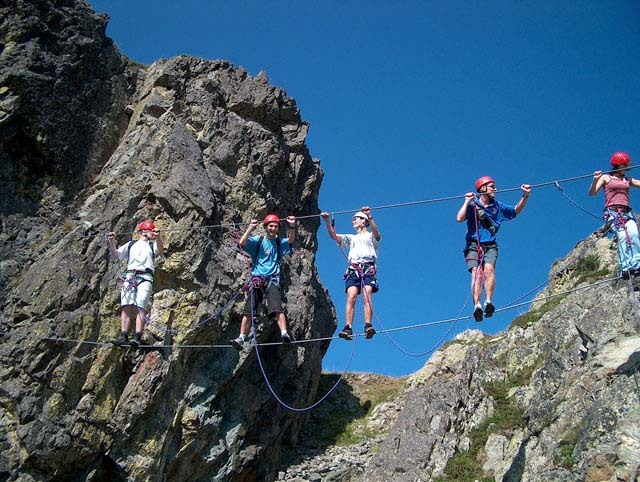 ), Bear Grylls, showed Deion how to use a via ferrata, which translates as “iron road.” Via Ferrata are fixed steel cables strung across difficult paths on mountain faces. 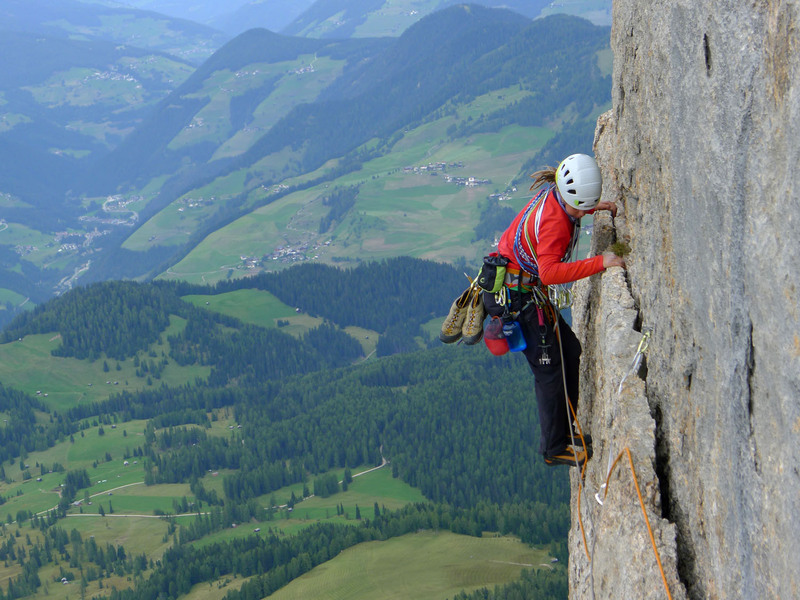 Originating in the Italian Alps, climbers use these cables to secure themselves with a carabiner, preventing falls. First, someone went before, and in the process, decided to do the extra work of making sure that those that came after didn’t fall. Kind of like, Jesus, huh? Also, these cables are permanent, fixed, and not able to be detached, allowing the individuals crossing these trails to make it safely to the other side. In spite of the height of the climb, or sheerness of the rock face, climbers attempting to cross don’t carry as much fear with them, because they know they’ll have a failsafe in case they fall. In other words, having the faith to cross is much easier, because they know that even if they fall, it won’t be all the way. Who knew that God could use a TV reality program to show me how to live my life with more faith in Him? I certainly didn’t. And while I don’t think that it means I’ll be a reality junkie any time soon, I do know that I’ll keep my mind open from now on. Because He can speak to me in ways I’d never imagine…. Hello Christine, My name is Rob Batchelder, and I am the Chairman of the National Eagle Scout Association (NESA) Committee in Connecticut Yankee Council, in Milford, CT. One of our new Eagle Scout very much wants to receive a letter of congratulations from Bear Grylls. Would you be so kind to share with me the address / method you used to reach Bear? Thank you!